KIPUSHI, DEMOCRATIC REPUBLIC OF CONGO — Robert Friedland, Executive Chairman of Ivanhoe Mines (TSX: IVN; OTCQX: IVPAF), and Lars-Eric Johansson, Chief Executive Officer, today announced the positive findings of an independent, pre-feasibility study (PFS) for the planned redevelopment of the company’s historic, high-grade, Kipushi zinc-copper-silver-germanium mine. 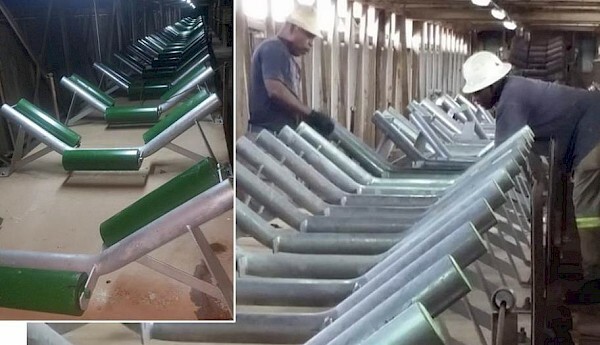 The study anticipates annual production of an average of 381,000 tonnes of zinc concentrate over an 11-year initial mine life at a total cash cost of approximately US$0.48 per pound of zinc. 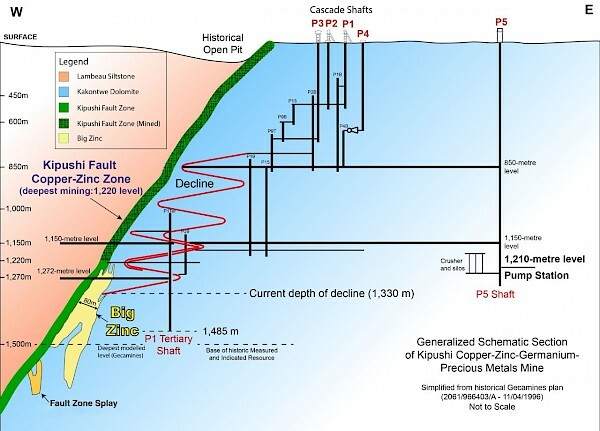 The PFS focuses on the initial mining of Kipushi’s Big Zinc Zone, which has an estimated 10.2 million tonnes of Measured and Indicated Mineral Resources grading 34.9% zinc. The planned return to production would establish Kipushi as the world’s highest-grade major zinc mine. 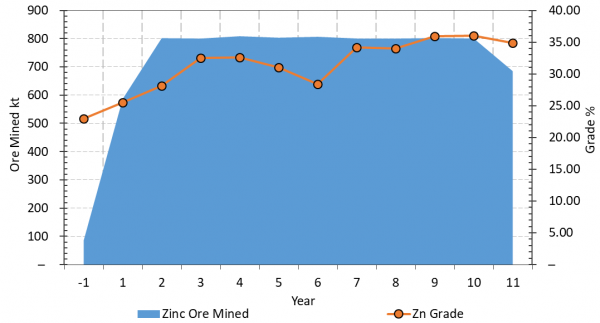 Its exceptional zinc grade is more than twice as high as the Measured and Indicated Mineral Resources of the world’s next-highest-grade zinc project, according to Wood Mackenzie, a leading, international industry research and consulting group (see Figure 2). 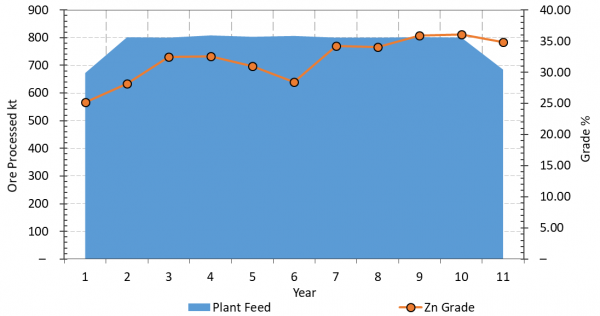 and zinc head grades (ranked by forecasted production by 2020). Note: Independent research by Wood Mackenzie concludes that at the forecast production and head grade, the Kipushi Project, once in production, will rank among the world’s largest zinc mines. Wood Mackenzie compared the Kipushi Project’s life-of-mine average annual zinc production and zinc head grade of 225,000 tonnes and 32%, respectively, against production and zinc head grade forecasts for 2020. 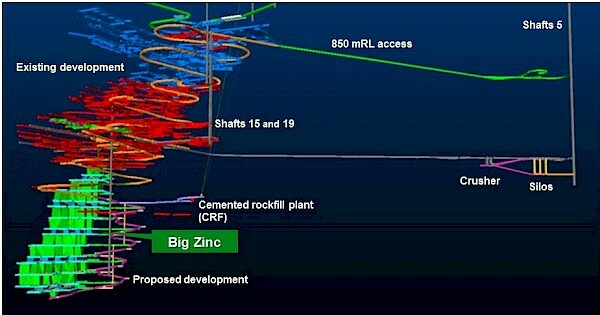 Given the significant, very-high-grade zinc resource at Kipushi, which is rich in potential by-product credits including copper, silver and germanium and the ongoing exploration campaign at Kipushi, Ivanhoe and the Gécamines technical team are continuing to investigate additional downstream processing options. “The pre-feasibility study is the latest validation that Kipushi has the resources to become one of the world’s largest and lowest-cost zinc producers, plus the potential to also produce significant quantities of copper, silver and germanium,” said Mr. Friedland. Mr. Johansson said that a definitive feasibility study, to further refine and optimize the project’s economics, is underway and is expected to be completed in the second half of 2018. “Since acquiring our 68% interest in the Kipushi Project in 2011, our team has worked closely with our partner, Gécamines, to move the project forward,” he added. The Mineral Resource used in the PFS has an effective date of January 23, 2016, and was estimated using The Canadian Institute of Mining, Metallurgy and Petroleum (CIM) Best Practice Guidelines and is reported in accordance with the 2014 CIM Definition Standards established by the Canadian Institute of Mining, Metallurgy and Petroleum. The Mineral Resource is classified into the Measured, Indicated and Inferred categories as shown in Table 1 for the predominantly zinc-rich bodies and in Table 2 for the predominantly copper-rich bodies. The Mineral Resource estimate was based on the results of 84 holes drilled at Kipushi by Ivanhoe Mines and an additional 107 historical holes drilled by Gécamines. Ivanhoe completed its drilling program for the Mineral Resource estimate in October 2015. Mineral Resource estimates were completed below the 1,150-metre-level on the Big Zinc Zone, Southern Zinc Zone, Fault Zone and Série Récurrente Zone. The Mineral Resources were categorized either as zinc-rich resources or copper-rich resources, depending on the most abundant metal. The Big Zinc and Southern Zinc zones have been tabulated using zinc cut-offs and are shown in Table 1; the Fault Zone, the Fault Zone Splay and Série Récurrente Zone have been tabulated using copper cut-offs and are shown in Table 2. For the zinc-rich zones, the Mineral Resource is reported at a base-case cut-off grade of 7.0% zinc and the copper-rich zones at a base-case cut-off grade of 1.5% copper. The Mineral Resource is reported as the total in-situ Mineral Resource and on a 100% project basis. The cut-off grade calculation was based on the following assumptions: zinc price of US$1.02 /lb, mining cost of US$50 /tonne, processing cost of US$10 /tonne, G&A and holding cost of US$10 /tonne, transport of 55% Zn concentrate at US$375 /tonne, 90% zinc recovery and 85% payable zinc. The cut-off grade calculation was based on the following assumptions: copper price of US$2.97 /lb, mining cost of US$50/tonne, processing cost of US$10/tonne, G&A and holding cost of US$10/tonne, 90% copper recovery and 96% payable copper. Figure 2: World’s top 20 zinc projects, by contained zinc. KICO has completed the refurbishment of a significant amount of underground infrastructure at the Kipushi Project, including a series of vertical mine shafts, with associated head frames, to various depths, as well as underground mine excavations. A series of crosscuts and ventilation infrastructure still are in working condition. 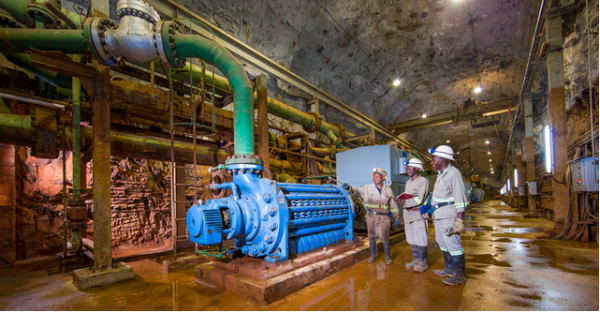 The underground infrastructure also includes a series of pumps to manage the influx of water into the mine. A schematic layout of the existing development is shown in Figure 3. The main production shaft for the Kipushi Mine, Shaft 5 (labelled as P5 in Figure 3), is eight metres in diameter and 1,240 metres deep, and has been upgraded and re-commissioned. The main personnel and material winder has been upgraded and modernized to meet global industry standards and safety criteria. The Shaft 5 rock-hoisting winder, which had an annual hoisting capacity of 1.8 million tonnes, is being upgraded and is expected to be fully operational early next year. Underground upgrading work is continuing on the crusher and the rock load-out facilities at the bottom of Shaft 5 and the main haulage way on the 1,150-metre level, between the Big Zinc access decline and Shaft 5. This work is expected to be completed before the end of the first quarter of 2018. Based on additional metallurgical test work and trade-off studies, Ivanhoe revised the planned process-plant design for the PFS. The optimized plant utilizes dense media separation (DMS), followed by milling and a flotation recovery plant. DMS is a simple density-concentration technique that preliminary test work has shown yields positive results for the Kipushi material, which has a sufficient density differential between the waste rock (predominantly dolomite) and mineralization (sphalerite). The addition of milling and a flotation recovery plant resulted in an overall recovery of 89.6%, producing a consistent high-grade concentrate of 58.9% contained zinc. The improved concentrate grade results in lower transportation costs as compared to the Kipushi 2016 PEA. The Kipushi Project includes surface mining and processing infrastructure, concentrator, offices, workshops and a connection to the national power grid. Electricity is supplied by the DRC’s state power company, Société Nationale d’Electricité (SNEL), from two transmission lines from Lubumbashi. Pylons are in place for a third line. On October 30, 2017, Ivanhoe Mines and the DRC’s state-owned railway company, Société Nationale des Chemins de Fer du Congo (SNCC), signed a MOU to rebuild 34 kilometres of track to connect the Kipushi Mine with the DRC national railway at Munama, south of the mining capital of Lubumbashi. Under the terms of the MOU, Ivanhoe has appointed R&H Rail (Pty) Ltd. to conduct a front-end engineering design study to assess the scope and cost of rebuilding the spur line from the Kipushi Mine to the main Lubumbashi-Sakania railway at Munama. The study has begun and construction on the Kipushi-Munama spur line could start in late 2018. Ivanhoe will finance the estimated US$32 million (plus contingency) capital cost for the rebuilding, which is included within the overall Kipushi 2017 PFS capital cost. The proposed export route is to utilize the SNCC network from Kipushi to Ndola, connecting to the North-South Rail Corridor from Ndola to Durban. The North-South Rail Corridor to Durban via Zimbabwe is fully operational and has significant excess capacity. Future proposed mine production has been scheduled to maximize the mine output and meet the annual nominal capacity of 800,000 tonnes of the DMS and mill-flotation plant. The mining production forecasts are shown in Table 4. Mine, process and concentrate production are shown in figures 6 to 8. 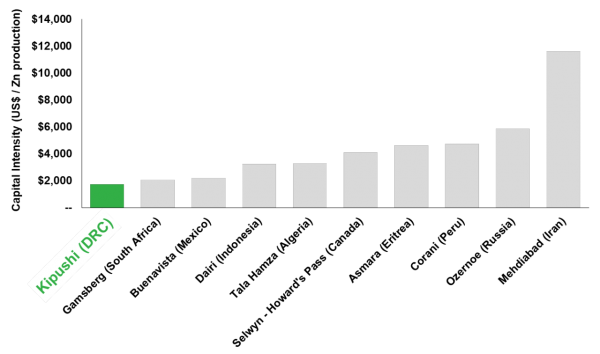 The estimates of cash flows have been prepared on a real basis as at January 1, 2018, and a mid-year discounting is used to calculate the NPV. The projected financial results for undiscounted and discounted cash flows, at a range of discount rates, IRR and payback are shown in Table 5. The key economic assumptions for the discounted cash flow analyses are shown in Table 6. 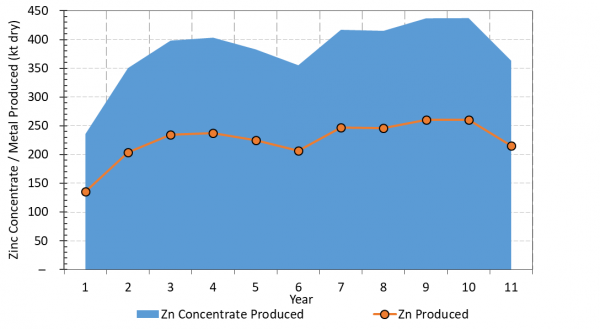 The results of NPV sensitivity analysis to a range of zinc prices and zinc treatment charges are shown in Table 7. A comparison of the Kipushi 2017 PFS key results to the Kipushi 2016 PEA is shown in Table 8. 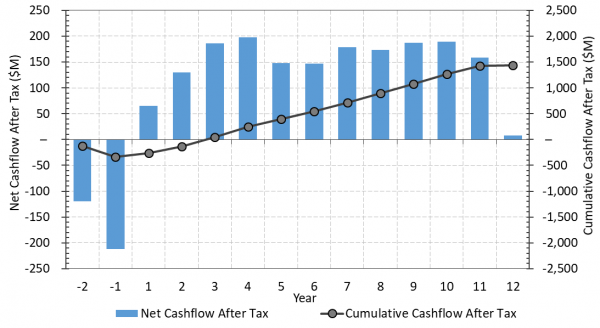 A chart of the cumulative cash flow is shown in Figure 9. 1. Based on long-term zinc price of US$1.01/lb and zinc treatment charge of US$190/t concentrate. 2. Based on long-term zinc price of US$1.10/lb and zinc treatment charge of US$170/t concentrate. The total capital cost estimates for Kipushi are shown in Table 9. 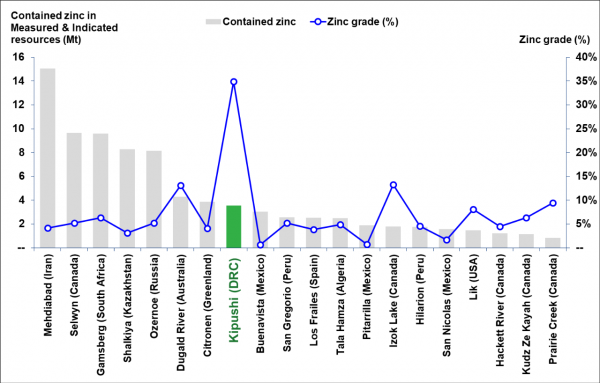 Kipushi’s estimated low capital intensity relative to comparable “probable” and “base case” zinc projects identified by Wood Mackenzie is highlighted in Figure 10. Source: Wood Mackenzie, December 2017. Note: All comparable “probable” and “base case” projects as identified by Wood Mackenzie. Source: Wood Mackenzie (based on public disclosure and information gathered in the process of routine research. The Kipushi 2017 PFS has not been reviewed by Wood Mackenzie). 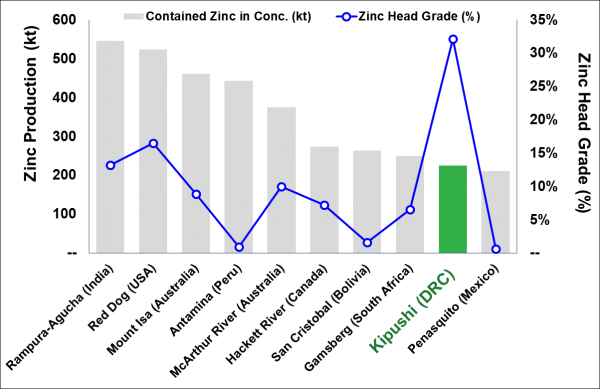 Kipushi’s estimated revenues and operating costs are presented in Table 10, along with the projected net sales revenue value attributable to each key period of operation. Kipushi’s estimated cash costs are presented in Table 11. 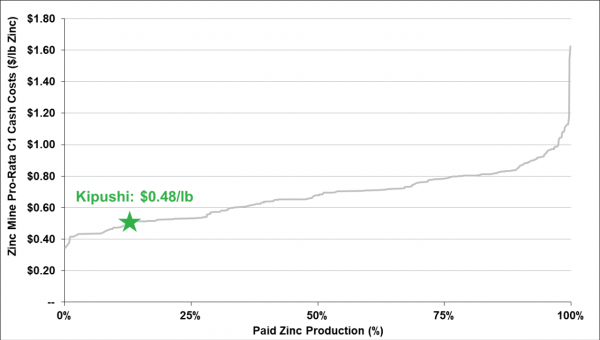 Based on data from Wood Mackenzie, life-of-mine average cash cost of US$0.48/lb of zinc is expected to rank Kipushi, once in production, in the bottom quartile of the 2020 cash cost curve for zinc producers globally (see Figure 11). Source: Wood Mackenzie, December 2017 (based on public disclosure and information gathered in the process of routine research. The Kipushi 2017 PFS has not been reviewed by Wood Mackenzie). Note: Represents C1 cash costs which reflect the direct cash costs of producing paid metal incorporating mining, processing and offsite realization costs, having made appropriate allowance for the co-product revenue streams. Figure 13: Shaft 5 main pumping station at the 1,200-metre level. from hole KPU140 in the recently completed underground drilling program. OreWin – Overall report preparation, mining, Mineral Reserve estimation and economic analysis. MSA Group – Resource and geology. MDM Engineering – Plant and surface infrastructure. Murray & Roberts – Underground mining infrastructure. Golder Associates – Environmental and hydrogeology. Grindrod Rail Consultancy Services – Railway and logistics. The independent Qualified Persons responsible for preparing the Kipushi 2017 PFS, on which the technical report will be based, are Bernard Peters (OreWin); William Joughin (SRK Consulting); John Edwards (MDM Engineering); and Michael Robertson and Jeremy Witley (MSA Group). Each Qualified Person has reviewed and approved the information in this news release relevant to the portion of the Kipushi 2017 PFS for which they are responsible. 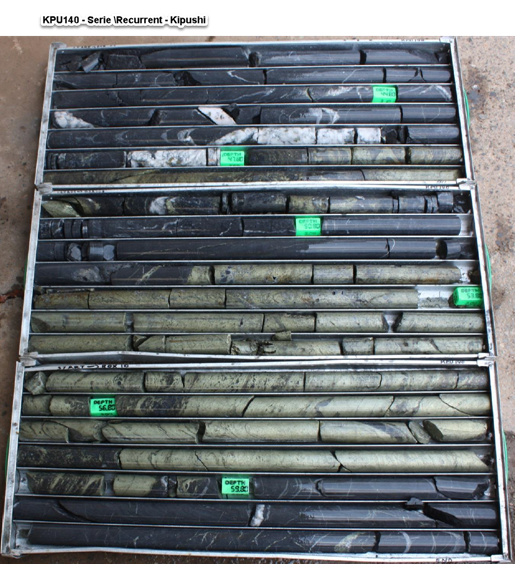 Other scientific and technical information in this news release has been reviewed and approved by Stephen Torr, P.Geo., Ivanhoe Mines’ Vice President, Project Geology and Evaluation, a Qualified Person under the terms of NI 43-101. Mr. Torr is not independent of Ivanhoe Mines. Mr. Torr has verified the technical data disclosed in this news release not related to the current Mineral Resource and Mineral Reserve estimates disclosed herein. Ivanhoe Mines maintains a comprehensive chain of custody and QA-QC program on assays from its Kipushi Project. Half-sawn core was processed either at its preparation laboratory in Kamoa, DRC, or its exploration preparation laboratory in Kolwezi, DRC. Prepared samples then were shipped to Bureau Veritas Minerals (BVM) Laboratories in Australia for external assay. Industry-standard certified reference materials and blanks were inserted into the sample stream prior to dispatch to BVM. Ivanhoe Mines’ QA-QC program has been set up in consultation with MSA Group (Pty.) Ltd., of Johannesburg. 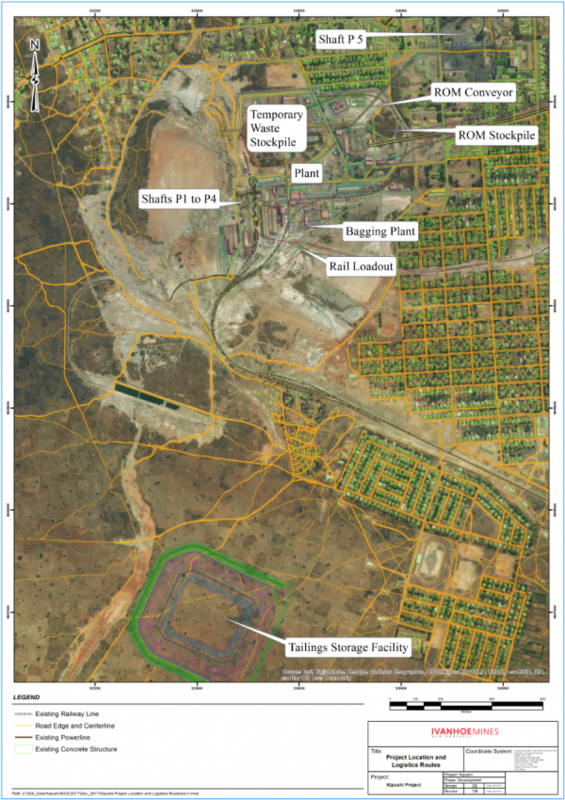 Ivanhoe has previously filed an independent NI 43-101 Technical Report for the Kipushi Project, titled “Kipushi Zn-Cu Project, Kipushi 2016 Preliminary Economic Assessment,” dated May 2016, which is available under the company’s SEDAR profile at www.sedar.com and on the company’s website at www.ivanhoemines.com. The technical report includes relevant information regarding the effective dates and the assumptions, parameters and methods of the 2016 mineral resource estimates on the Kipushi Project cited in this news release, as well as information regarding data verification, exploration procedures, sample preparation, analysis and security. Ivanhoe Mines will be filing a new NI 43-101 Technical Report for the Kipushi 2017 PFS disclosed herein within 45 days of this news release. Wood Mackenzie provided data based on public disclosure of comparable projects for the compilation of certain figures used in this news release; however, Wood Mackenzie did not review the Kipushi 2017 PFS. Ivanhoe Mines is advancing its three principal projects in southern Africa: Mine development at the Platreef platinum-palladium-gold-nickel-copper discovery on the Northern Limb of South Africa’s Bushveld Complex; mine development and exploration at the Kamoa-Kakula copper discoveries on the Central African Copperbelt in the DRC; and upgrading at the historic, high-grade Kipushi zinc-copper-lead-germanium mine, also on the DRC’s Copperbelt. For details, visit www.ivanhoemines.com. Certain statements in this news release constitute “forward-looking statements” or “forward-looking information” within the meaning of applicable securities laws. Such statements involve known and unknown risks, uncertainties and other factors, which may cause actual results, performance or achievements of the company, the Kipushi Project, or industry results, to be materially different from any future results, performance or achievements expressed or implied by such forward-looking statements or information. Such statements can be identified by the use of words such as “may”, “would”, “could”, “will”, “intend”, “expect”, “believe”, “plan”, “anticipate”, “estimate”, “scheduled”, “forecast”, “predict” and other similar terminology, or state that certain actions, events or results “may”, “could”, “would”, “might” or “will” be taken, occur or be achieved. These statements reflect the company’s current expectations regarding future events, performance and results, and speak only as of the date of this news release. All of the results of the Kipushi 2017 PFS represent forward-looking information and statements. Statements in this news release that constitute forward-looking statements or information include, but are not limited to: (1) statements regarding the redevelopment plan to bring Kipushi’s Big Zinc Zone into production in less than two years; (2) statements regarding successful restoration of production would establish Kipushi as the world’s highest-grade major zinc mine; (3) statements regarding the Kipushi Project having an after-tax NPV of US$683 million and an IRR of 35.3%; (4) statements regarding Kipushi has an after-tax NPV of US$1.2 billion and IRR of 51% at the current zinc price of approximately US$1.40/lb; (5) statements regarding pre-production capital estimated at US$337 million; (6) statements regarding future mine production including that mine production is expected to be at a steady-state annual mining rate of 800,000 tonnes; (7) statements regarding annual production of an average of 381,000 tonnes of zinc concentrate over an 11-year initial mine life at a total cash cost of approximately US$0.48 per pound of zinc; (8) statements regarding independent research by Wood Mackenzie concludes that the Kipushi Project could rank among the world’s largest zinc mines; (9) statements regarding that Kipushi has the resources to become one of the world’s largest and lowest-cost zinc producers, plus the potential to also produce significant quantities of copper, silver and germanium; (10) statements regarding that the planned life-of-mine average annual zinc production is 225,000 tonnes and zinc head grade is 32%; (11) statements regarding that the project life-of-mine average cash cost of US$0.48/lb of zinc is expected to rank Kipushi, once in production, in the bottom quartile of the cash cost curve for zinc producers globally; (12) statements regarding the work to upgrade the rock load-out facilities at the bottom of Shaft 5 is expected to be completed before the end of the first quarter of 2018 and that the Shaft 5 rock-hoisting winder is expected to be fully operational early next year; (13) statements regarding the proposed rail export route for zinc concentrate to the port of Durban, South Africa; (14) statements regarding construction on the Kipushi-Munama spur rail line could start in late 2018; and (15) statements regarding expected methods of mining and processing. The forward-looking information and statements also includes metal price assumptions, cash flow forecasts, projected capital and operating costs, metal recoveries, mine life and production rates, and other assumptions used in the Kipushi 2017 PFS. Readers are cautioned that actual results may vary from those presented. The factors and assumptions used to develop the forward-looking information, and the risks that could cause the actual results to differ materially will be presented in the body of the Technical Report that will be filed on SEDAR at www.sedar.com and Ivanhoe Mines’ website at www.ivanhoemines.com within 45 days of this news release. All such forward-looking information and statements are based on certain assumptions and analyses made by Ivanhoe Mines’ management in light of their experience and perception of historical trends, current conditions and expected future developments, as well as other factors management believe are appropriate in the circumstances. These statements, however, are subject to a variety of risks and uncertainties and other factors that could cause actual events or results to differ materially from those projected in the forward-looking information or statements including, but not limited to, unexpected changes in laws, rules or regulations, or their enforcement by applicable authorities; the failure of parties to contracts to perform as agreed; social or labour unrest; changes in commodity prices; unexpected failure or inadequacy of infrastructure, or delays in the refurbishment or development of infrastructure, and the failure of exploration programs or other studies to deliver anticipated results or results that would justify and support continued studies, development or operations. Other important factors that could cause actual results to differ from these forward-looking statements also include those described under the heading "Risk Factors" in the company's most recently filed MD&A as well as in the most recent Annual Information Form filed by Ivanhoe Mines. This news release also contains references to estimates of Mineral Resources and Mineral Reserves. The estimation of Mineral Resources is inherently uncertain and involves subjective judgments about many relevant factors. Mineral Resources that are not Mineral Reserves do not have demonstrated economic viability. The accuracy of any such estimates is a function of the quantity and quality of available data, and of the assumptions made and judgments used in engineering and geological interpretation, which may prove to be unreliable and depend, to a certain extent, upon the analysis of drilling results and statistical inferences that may ultimately prove to be inaccurate. Mineral Resource and Mineral Reserve estimates may have to be re-estimated based on, among other things: (i) fluctuations in zinc or other mineral prices; (ii) results of drilling; (iii) results of metallurgical testing and other studies; (iv) changes to proposed mining operations, including dilution; (v) the evaluation of mine plans subsequent to the date of any estimates; and (vi) the possible failure to receive required permits, approvals and licences.